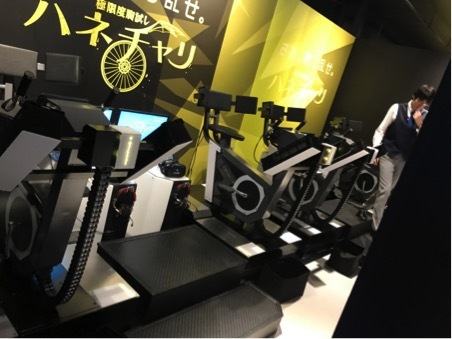 This month, we will be taking a look at one of Tokyo’s latest attractions, VR Zone Shinjuku. This virtual reality theme park opened at the start of summer 2017 and is now one of the hottest spots in town. Located in Kabukicho near the infamous Robot Restaurant, this futuristic wonderland is a sight to behold. If you’re a gamer or otherwise interested in checking out some of the cutting edge virtual reality, then this is a highly recommended place for you. 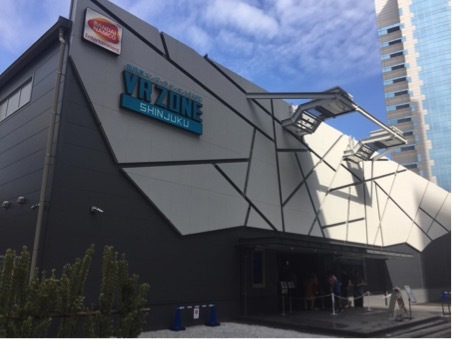 One-day tickets for VR Zone Shinjuku can be purchased for 4,400 yen. You can reserve tickets on either the VR Zone website or via a special app. The website also provides additional information available in both English and Japanese. Visitors basically pay for the opportunity to sample up to four attractions. You’ll receive a red, yellow, blue, and green ticket which can be used on one of the following experiences. Since the tickets are divided by genre, this unfortunately means you’ll need to make some hard decisions; choose wisely! In addition to the four-colour tickets, there are also other experiences that you can partake in such as: a rock climbing attraction, a panic room, and a Niagara waterfall drop. You can pay for these on site or sacrifice one of your coloured tickets but it’s recommended not to do so. 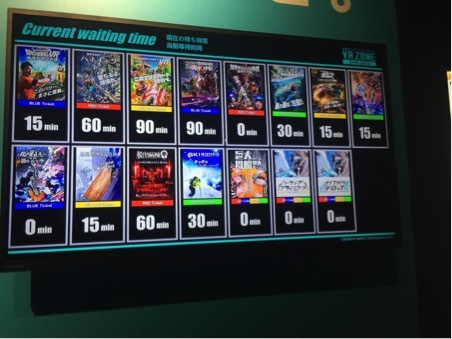 The added attractions only cost an additional 1,000 yen; it’s not like you can just go get more of the red, yellow, blue, or green tickets. Queues are expected to be long daily. If you are in a rush and have extra cash to squander, it might be worth it to consider opting for an express ticket that lets you skip the line. Given wait times much like Disneyland for the most popular attractions, the express ticket can be easily worth its weight in gold. When you purchase a ticket you will need to select a convenient entrance time. This measure allows the VR Zone to monitor and control the flow of people entering the venue. Keep in mind that you will not be allowed to enter the venue until 15 minutes before your designated time. Once inside, you can stay as long as you wish. Should you arrive early, I suggest you kill some time visiting Shinjuku’s famous Godzilla statue that is located nearby. When your specified check-in time arrives, you will pick up your tickets to the right of the entry gates. Regardless of whether you booked on the website or via the app, you’ll need to show a QR code that will be scanned by the staff confirming your reservation. Be sure to have this code on hand and take a backup screen-shot just in case. The very last thing you want to do is show up and not be able to get in! With tickets in hand, you are finally free to explore. The interior attractions are situated around the giant centre column shown above and are located on both the entry and second floors. Be sure not to miss the chic Glampers cafe on the right-hand side after entering. This cafe features some delectable treats and make use of cutting edge projection mapping to create the illusion of being in nature. As previously noted, you will need to make some tough decisions regarding which attractions you want to experience. In a perfect world wait time would not be a factor; but alas, VR lines can often be up to 90 minutes long for some experiences. If you’re in a rush, I cannot more highly recommend paying the extra fee for the express pass. This is not the time you want to be penny wise and time foolish! Of all the attractions, one of the worst time offenders is the yellow ticket’s Mario Kart Arcade GP VR. If you’re planning on giving this a try, prepare to wait upwards of two hours for your experience. 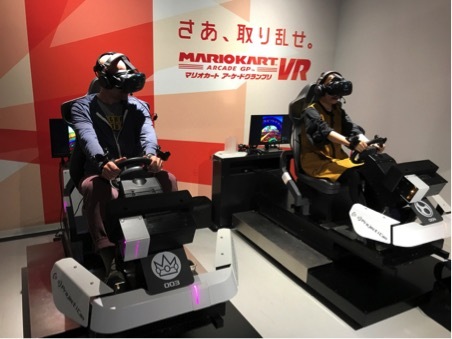 While some of the other experiences have more niche appeals, everyone loves Mario Kart and wants to try it in VR. If you’re not in the mood to wait, you’d do well to opt for either of the other options instead. Mario Kart aside, if you’re a fan of anime and manga, I suggest you start first with the blue ticket. This is arguably the hardest of all the decisions you’ll need to make so it’s best to get it out of the way first. You’ll need to choose between three legendary universes, Dragonball, Gundam and Evangelion. In a nutshell, each of the tickets has its own novel theme. For example, the red ticket features a collection of terrifying experiences such as the frightful, Hospital Escape Terror. As a note of caution, if you scare easily, I suggest skipping both the Hospital Escape Terror and the Jungle of Despair. Instead, I recommend you opt for the flying Wing Bicycle; after all, you really don’t want to embarrass yourself by having an “accident” while strapped in. The virtual reality theme park opened at the start of summer 2017 and is now one of the hottest spots in town.